If ever there were a question of what an American version of a EuropaCorp production might look like, Puerto Ricans In Paris attempts to provide an answer, at least conceptually. The EuropaCorp version of two Puerto Rican cops from New York City hired to conduct an investigation in Paris would likely involve far more shooting, chasing, and incoherent cutting than this comparatively gentle, only occasionally crass movie. But its high-concept, culture-clashed European setting and slapdash screenplay might make Luc Besson jealous he didn’t get to the idea first. 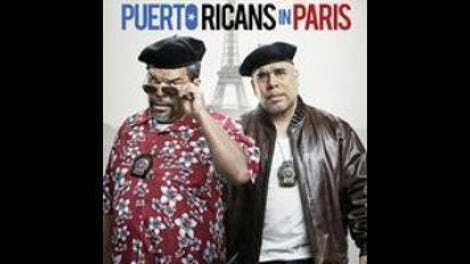 While it’s easy to describe Puerto Ricans In Paris generically, it sets up something more specific, in terms of both its characters’ Puerto Rican heritage and their specialty in a particularly New York crime. The opening credits roll over a sequence intercutting NYPD cops Luis (Luis Guzmán) and his partner/brother-in-law, Eddie (Edgar Garcia), pursuing a seller of counterfeit handbags with close-up footage of knockoff bags being assembled. Their success in busting Canal Street bag hustlers catches the improbable attention of Colette (Alice Taglioni), a French designer whose newest prototype has been stolen. She decides the most expedient solution is to hire these two cops to visit Paris and perform a lackadaisical investigation. The movie lines up suspects for Luis and Eddie like a game of Clue, only simpler: There are four potential culprits who had access to Colette’s office, who they will interview undercover by donning a series of thin disguises. This leaves plenty of time for sightseeing, though Eddie feels bad for leaving his wife, Gloria (Rosie Perez), at home. Luis, meanwhile, seems profoundly unaware of how lucky he is that his devoted (if somewhat fed up) girlfriend is played by Rosario Dawson, just as the movie seems profoundly unaware of how lucky it is to have convinced Dawson to appear in two scenes as the romantic partner to a potbellied character actor two decades her senior. Guzmán has been a delightful presence in countless movies over the years, and it’s neat to see him take on an unambiguously leading role, especially one focusing on two Puerto Rican characters. But the movie’s Luis is a surprisingly dull Ugly American, hitting on French ladies and expressing bafflement at Eddie’s enthusiasm for macaroons; even his references to being Puerto Rican seem largely interchangeable (though at least they aren’t outdated, like the movie’s repeated allusions to the canceled Fox series X Factor). Often Guzmán finds himself reduced to a sight gag—though to be fair, it is funny to see him outfitted in an airbrushed Bruno Mars T-shirt. Eddie, meanwhile, is the more sensitive of the two guys who call each other “bro” incessantly. Enthusiastic about seeing Paris, he bonds with Colette, and there’s a mild wistfulness to their mutual consideration of the aging process. So why must Colette have a young son who takes an immediate and ridiculous shine to Eddie? At first, it looks like most of the film’s Paris color will come from the yellowish interior of various hotels and bars. Eventually, this gives way to some yellowish Paris exteriors; the movie’s color timing should add Steven Soderbergh to the list of potentially jealous filmmakers. Then again, the low-key, extremely modest charms of Puerto Ricans In Paris aren’t really substantial enough to inspire real jealousy in anyone. The handbag mystery, such as it is, gets resolved swiftly and amicably in a mere 82 minutes. This is almost quick enough to ignore how few laughs and how little excitement the movie contains, but not quite.